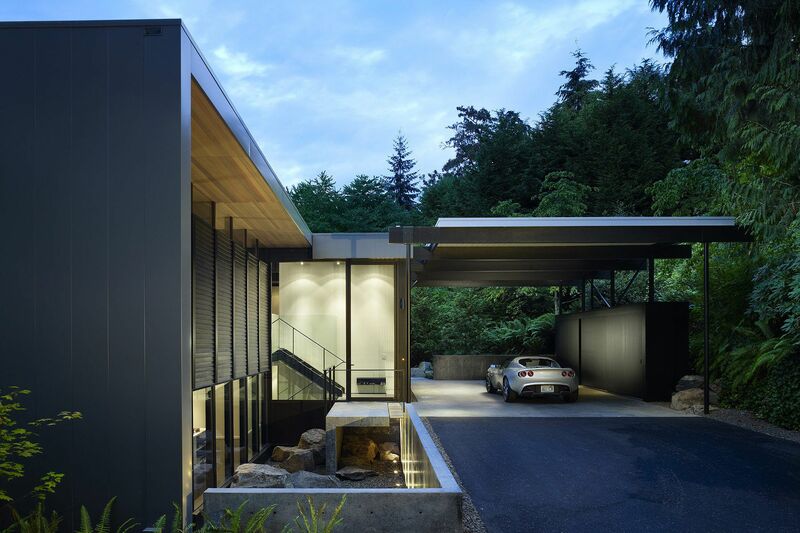 This house is a complete remodel of one of iconic Seattle architect Fred Bassetti’s earliest designs. The entry approach was redesigned with a cantilevered concrete landing in the sunken Courtyard and a large glass pivot door. All photography by Benjamin Benschneider. The relationship of interior to exterior space is enhanced with large sliding doors and celebrated with the creation of new outdoor spaces that extend out from the interior. While appreciating the classic modern structure, the owners wanted to open up the floor plan, update all finishes, and tailor the home to suit their interests and lifestyle. Our goal was to respect the original intent and spirit of the design while making the house reflective of its owners, of its time, and a new celebration of its place. The steel Pantry/Office provides needed storage and provides a separation between the living areas and the sleeping space. 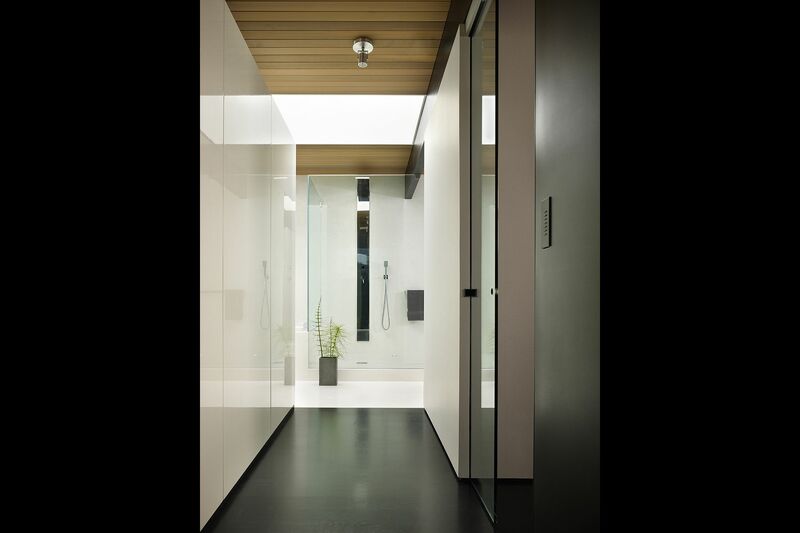 Wet areas and bathing spaces are ethereally bright, smooth and seamless. Milestone acrylic cement plaster was used to achieve the seamlessness quality, and also impart a depth with a hand patina. Materials throughout are natural but installed and crafted in an extremely crisp manner. The lower floor is a media room and office, flanked by windows to patios. A new aluminum bar grating screen encloses the Outdoor Room and Main Floor Deck, filtering interior views and forming a sparkling and diaphanous wall from the street. New metal cladding with interior cedar liner wraps over the house and grounds it to the site. 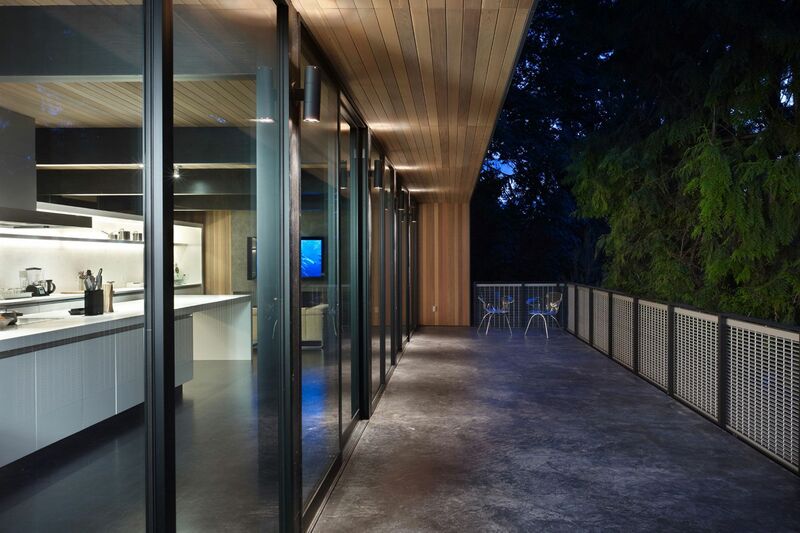 An award winning complete remodel and re-imagining of a mid-century residence.